AIP Foundation’s model, developed in Vietnam, has been adapted to other countries through the Global Helmet Vaccine Initiative (GHVI). In 2009, AIP Foundation, in collaboration with the FIA Foundation and the World Bank, established GHVI to put a helmet on every head in the Decade of Action for Road Safety (2011-2020). GHVI works to support the establishment of Country-Level Helmet Vaccine Initiatives, led by a nongovernmental organization and involving government, corporate, and research partners. The multifaceted GHVI approach relies on five pillars: targeted programs, public awareness education; global and legislative advocacy; research, monitoring and evaluation; and helmet production. GHVI currently operates in Vietnam, Cambodia, Thailand, Uganda, and Tanzania. Why focus on helmets as a road safety intervention? AIP Foundation focuses on helmets as a road safety intervention because: 1) in developing countries, motorbikes are the vast majority of the vehicles on the road and are involved in more accidents than any other type of vehicle 2) wearing a helmet has been proven to reduce the risk of death by 42% and serious injury by 69% in the event of a crash 3) helmets can be produced in-country, creating jobs and supporting road safety programs, and 4) helmets are tangible, their use easily enforced, and wearing rates easily tallied, given human and financial resources. What is a quality helmet? The most important aspect of a quality helmet is its inner EPS lining. This is because the lining mitigates the impact of hitting the ground, absorbing the shock and protecting your brain. Look inside a helmet. There should be a white material that is too hard for fingernail penetration. If it is soft enough for your fingers to dent, it holds virtually no safety value. A hard outer shell protects your brain from sharp intrusive objects and a strap that fits snugly under your chin and around your ears ensures that the helmet sits on the correct place on your head. Who should wear helmets, and when? Every man, woman and child riding two- or three-wheeled vehicles – whether motorbikes, tuk-tuks or bicycles – should wear a helmet. All passengers and drivers should wear a helmet to protect their head from serious trauma and injury. Helmet use is essential regardless of the time of day, the intensity of the traffic, the speed of the vehicle, or the length of the trip. Why focus on public safety awareness education? Studies have shown that road traffic crashes are most often a result of driver ignorance. Sharing knowledge and facts, and highlighting the consequence of the correct road safety behavior, addresses one of the main factors that lead to road traffic crash injury and death. Additionally, public awareness campaigns reach the majority of the population through a variety of media – television, radio, print, outdoor advertisements and live events – which engage all sectors of society. Why organize programs through schools? Children are the future of any society, and in developing countries they make up a large percentage of the population. By targeting this population in our programs, we enjoy an impact on an impressionable and powerful part of society. 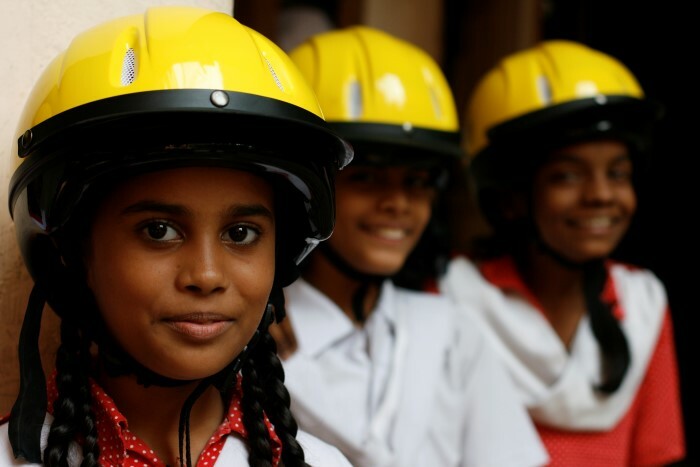 Educating youth is a way to transform safe traffic behavior and helmet use into social norms. School systems have built in communication lines between students, parents, the government, the local police, and administrators. This ensures that AIP Foundation messages reach all actors involved in enforcement of helmet use and safe traffic behavior.